On this site we have summarized the top key features of the recent releases on Simufact Forming. Please read and watch the videos to get an overview on the top highlights of each respective version. Do you want to know which key features we have implemented in the previous versions? Familiarize yourself with the top new key features of each respective versions. Please note that we only provide the key features for the last three versions. Simufact Forming comes with a newly developed GUI operation concept: Highly interactive context-related user dialogs allow for a direct access to all relevant settings, which provides a completely new handling experience. Users benefit from an ease-of-use modelling procedure via mouse or touchpad, and finally a higher productivity in results evaluation. The new application module Pressure Welding allows for simulating Resistance Welding processes, which includes Friction Welding, Friction Spot Welding, and Resistance Spot Welding. Generally spoken, pressure welding stands for a group of processes which join components by heating by friction or electrical current in combination with compression. 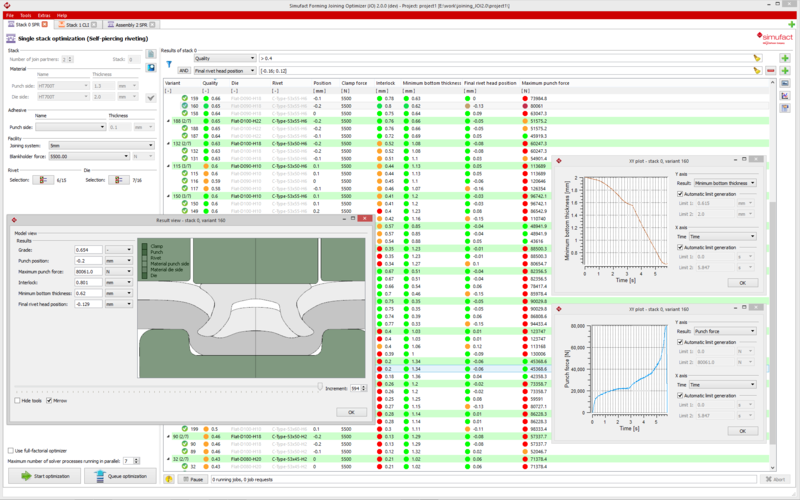 The module´s functionality puts its focus on the process simulation and helps examine the single welding spot – combining forming and thermal joining aspects. Pressure welding processes are often employed in Hot Forging for Electrical Upsetting. Cold forming companies benefit from pressure welding since this module allows for prolonging their process chain for subsequent projection welding processes. 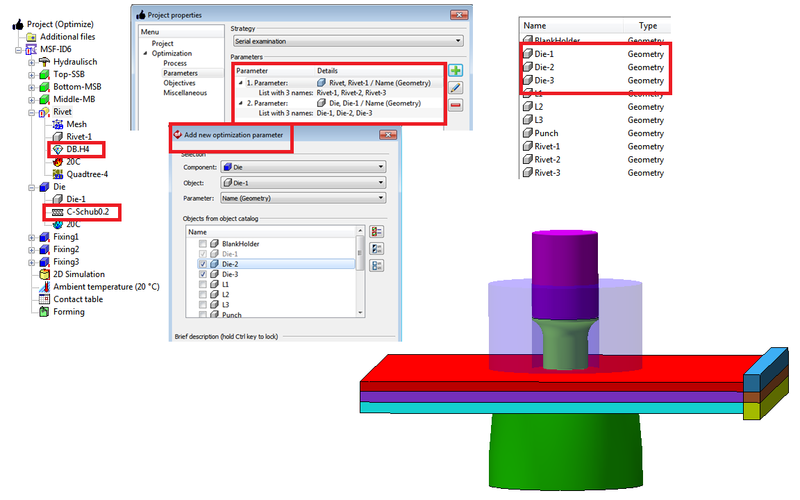 With Simufact Forming 14, all users obtain full access to the rolling module since it is included in the Forming Hub now. Customers employed with Hot Forging, Cold Forming and other processes requested a general availability of rolling simulation functionality since rolling is a typical pre-forming process. 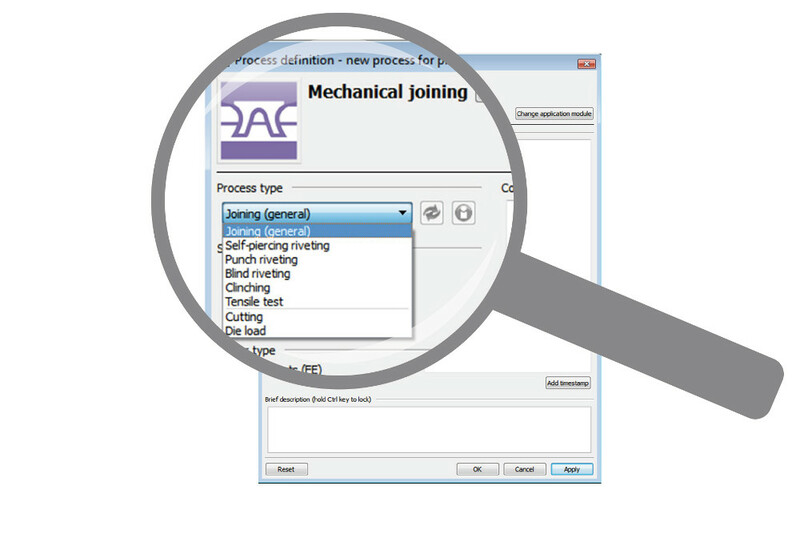 When choosing a dedicated process type the software provides application-specific pre-settings, which reduces efforts for the model design and shortens pre-processing time. In addition, the Mechanical Joining module comes with new automation capabilities for model design (pre-processing), and evaluation of the most relevant geometrical parameters (post-processing). The positioning and simulation of adhesives has been further improved. 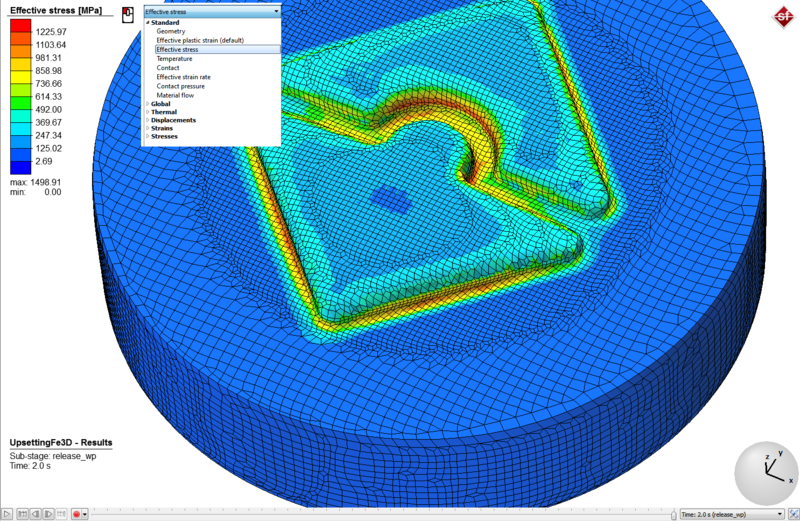 Simufact Forming is now supporting automatic serial evaluations of tool geometries and boundary conditions. 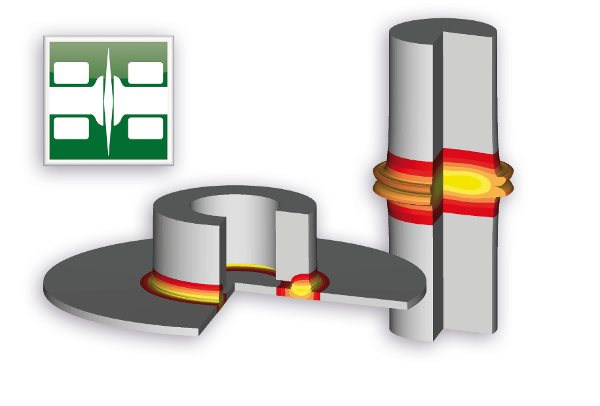 This functionality can be used for automated try-out of alternative die designs and for process stability examinations. Simufact Forming now provides an interface for data import from ProCAST (ESI), one of the most widespread casting simulation software applications. The interface allows to smoothly import casting simulation results like porosity and segregations into Simufact Forming for subsequent forming simulation (e.g. in open die forging) – in order to predict the position of segregations in the forged part and the remaining porosity. 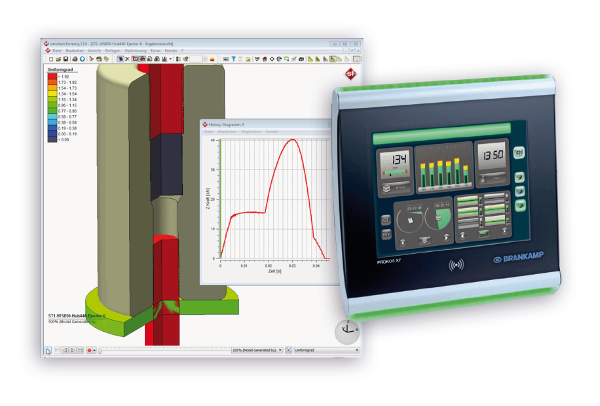 Presented at the wire show 2016 by the example with cold forming specialist Moehling – now it´s available in the product: Simufact Forming 14 comes with an interface to Brankamp process monitoring systems. By linking process simulation with process monitoring, Simufact and Brankamp remarkably contribute to the Industry 4.0 idea and open up new beneficial approaches for cold forming companies. Allows the use of a set-point and actual comparison of measured and simulated forces to be set up in the same way as the process was previously simulated or optimized: "Manufactured as simulated". As a result, the tool life can be increased during cold forming. In cooperation with MatCalc Engineering, Simufact has added an interface for the import of high-quality aluminum material data. 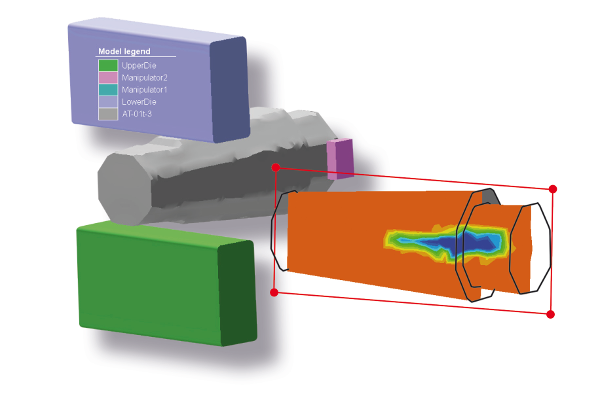 This improves Simufact Forming capabilities for simulating aluminum forming processes. 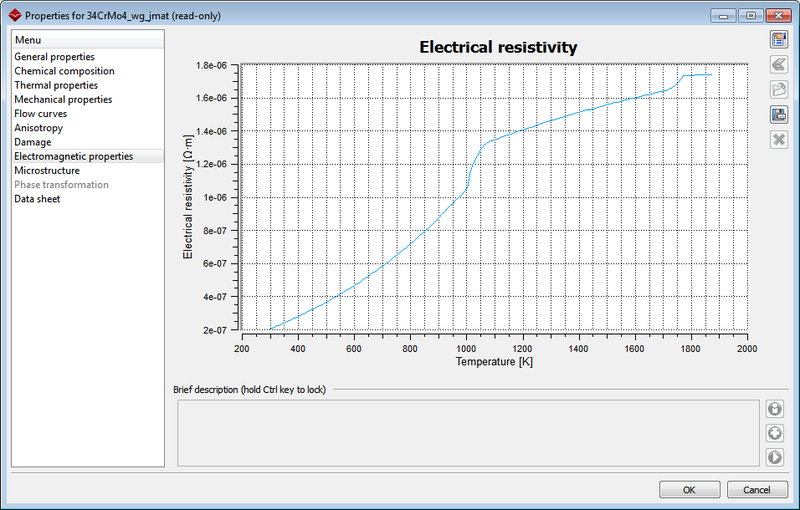 In addition, Simufact has enhanced their JMatPro interface and the Simufact Materials database for electrical material properties. 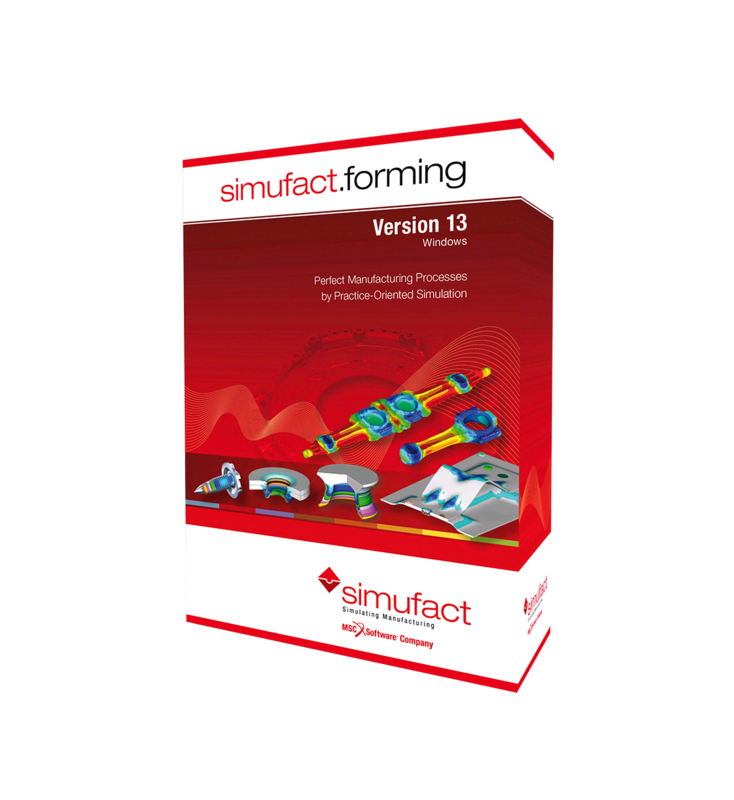 The cover of the new Simufact.forming 13 software box illustrates the simulation of a forged conrod and a mechanical joining process chain. User-defined Parameters: With user-friendly mathematical formulas, users can now generate their own parameters based on those of the simulation. This function simplifies the post processing needed when examining the variables in the design process. Routine designs can be automatically evaluated, which substantially cuts down the time taken to find the best design for the manufacturing process. Tracking of Post Particles: Post particle tracking helps users finding the causes of typical mistakes in a massive forming process. Post particles are user-defined measuring points for the parameters. The user can define them after the actual simulation, during post processing, and during all process steps whilst running the simulation both forward and backward. Shared-Memory Parallelization: The more powerful shared-memory parallelization (SMP) replaces multiple-threading parallelization. SMP reduces computation times by up to 50 percent when calculating with an FE solver by implementing an additional parallelization to the assembly of the stiffness matrix. Computation times with the FV solver are shortened by 10 to 25 percent. Status display for remote synchronizing: An addition to the progress of the simulation is the expanded status bar that now displays the state of remote synchronizing - and the transfer of the simulation results to the local client. This function is useful for client-server installations where calculations are done on network resources rather than on the client. Automatic definition of symmetry levels: The automatic definition of symmetry levels saves the user the time and effort it would take to manually define the levels and the time and effort needed to adjust the press force and maximum force. Export results using the I-DEAS Universal format: Simulation results can now be exported for further use in the I-DEAS Universal format, e.g. for a subsequent structure simulation.